By 1917, Britain was feeling the impact of war on the food supply. The government introduced rationing for certain types of food the following year. Both Britain and Germany pursued a policy of naval blockade from early in the war: attempting to stop ships delivering essential supplies to enemy countries. The blockade exacerbated problems in food production at home, since male agricultural and factory workers were away on the front. As a result, food shortages and high prices were a problem for most of the warring nations. In 1916, anticipating the problems ahead, the British Government created a new Ministry of Food Control. The Food Control Minster was responsible for managing the supply and distribution of food among the British population. While the Navy fought to keep imported supplies afloat, the Women’s Land Army was created in 1918, recruiting female volunteers to work the land while male agricultural workers were away at war. In one very important particular the food-supply of this country is already short, and has every chance of becoming shorter. The government responded with a public campaign for voluntary rationing, calling on the British populace to restrict its own purchasing and intake of key items like bread, meat, tea and sugar. This failed to have the desired effect, and in January 1918 compulsory rationing was introduced. Sugar rationing was soon followed by restrictions on butter and meat. 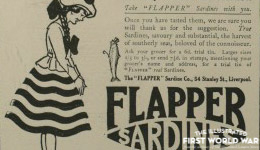 Purchases were regulated by coupon books, distributed to the civilian population. Articles from the ILN in early 1918 provide a snapshot of the nation as it dealt with these new regulations. Food brands like Oxo and Bird’s Custard marketed their products as a nutritious, freely available substitutes for rationed food, while others offered ‘ration hints’ and cooking tips for adapting to the new regulations. Harrods even introduced a line of new ration-book wallets for the stylish ration-shopper. Rationing in Britain was relatively light – a fact highlighted in the Illustrated London News, which reported the new restrictions in a positive tone. An article in March 1918 and featured a large, illustrated graph comparing Britain with Germany and Austria-Hungary, while another described British rationing as ‘A Cornucopia as Compared with Germany’.